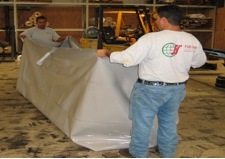 When you are in need of water storage tank liners, Fab-Seal Industrial Liners, Inc., is the leading manufacturer for a wide range of tank liner industrial uses. For 30 years, the industry experts at Fab-Seal have been successfully designing, fabricating and installing flexible Poly Vinyl Chloride (PVC) water storage tank liners. Fab-Seal custom fabricates one-piece liners in our state-of-the art factory, using the art of radio frequency sealing technology, saving significant down time. The high quality water storage tank liners available at Fab-Seal have excellent resistance to inorganic and alkalis, as well as a wide range of other corrosive chemicals. Call 800-874-0166 today to speak to one of our knowledgeable industry professionals and discover how Fab-Seal Industrial Liners, Inc., can handle your water storage tank liner manufacturing and installation needs. Fab-Seal offers three decades of expert design, fabrication and installation of tank liners worldwide. The industry experts at Fab-Seal produce water storage tank liners made from the highest quality materials, manufactured with extreme compatibility to most inorganic and corrosive fluids, with a cost-effective approach to installation. For three decades, Fab-Seal has offered expert design, fabrication and installation of water storage tank lining, and even our large metal tank and concrete tank liners can generally be installed in a week or less. Fab-Seal’s internally fitted, mechanically held, flexible membrane water storage tank liners system saves significant amounts of down time and saves you money on the cost of preparation for installation. Call 800-874-0166 today and find out how the industry professionals at Fab-Seal Industrial Liners, Inc., can handle your water storage tank liners manufacturing and installation needs. Or simply click the Request a Quote button to the right and one of our representatives will respond to your inquiry shortly.